One of the strategies that can draw a high profit from the roulette table even while playing for a long time is called the Angelika System. This system was names after Angelika Tepperwein, who caused sleepless nights for many casino manager in the 1960s. Tepperwein managed to gain a fortune in German casinos time after time. The Angelika system has thus become one of the most famous roulette systems since the 60s. Even so, there is very little awareness of the Angelika system amongst the younger generation of players. As Angelika herself proved at one point, this system can help you to play a fortune together with roulette. Fraulein Tepperwein came across this system through her own invention, through a system of pure rationale, instead of emotional patterns. Almost 25 years ago, a German magazine by the name of “I am a master in making millions” published a terrifying article. 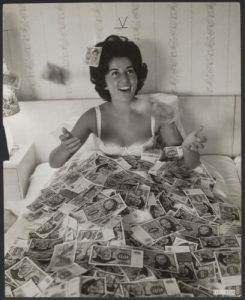 This article showed images of a young woman stacking her 100-mark notes. Large stacks of chips lay at her fingers. Angelika Tepperwein played through the use of this specific system with her husband at the roulette tables of Casino Travemünde, and won time, and time again. Later, images from the video cameras that recorded Angelika and her husband playing behaviour where released. The local magazine has somehow acquire the video images, most likely from someone in the casino security department, and immediately published an article to inform the world. How does the Angelika System work? The Angelika System is a variation and combination of the d’Alembert System and the Ascot System, The system consists of a specific progression added to the basic principle of “simple chance”. The Angelika System can easily be used through the use of a base bet. The idea is to increase or decrease the base bet with a certain amount each round, depending whether you won or lost the last round. You play with the starting bet of € 10 and a base bet of € 1 per bet. In the first round, you add € 10 to the roulette table. Only play on the high-chance positions, such as red/black, odd/even, 1 – 18/ or 18 – 36, since the house benefit is then only 2.7%. You have almost 50% chance of a profit in this case, where you can put the Angelika system into practise. Did you win the first round? Then you decrease your next bet with your base bet. So you bet with € 10 minus your base bet, € 1, leading to € 9. Did you lose the next round? Then you increase the bet by your base bet again, to make up for your losses. You can increase the pace by placing chips on all the high-chance options. So either red or black, as well as either odd or even, and either 1 – 18 or 19 – 36. This way you can speed up your wins if you’re on a roll. Does the Angelika System work at Online Casinos? At land-based casinos, it’s well-known that dealers as well as security keep an eye on you. At online casinos, this isn’t the case. During online roulette, you can easily make use of the Angelika system. There are no cameras, and no chance of being disallowed from the online casino due to winning too much after a while. As with any system however you need to have good sequences in order for the system to succeed. Thus, do not go on forever to try and prove that the system works, as it might change your luck. If this system doesn’t work for you, you might care to try one of the other strategies. 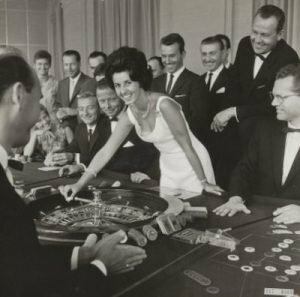 Side note: Even though this roulette system is named, and made famous by Angelika Tepperwein, her husband, Kurt Tepperwein, was a professor, and was later on believed to be the brains behind the system.